A young girl tells the story of her family's tragic demise using a deck of cards of the eponymous Mexican game in this spellbinding debut novel that marks the arrival of a powerhouse new talent. Neither the social worker assigned to her case nor her Aunt Tencha, who desperately pleads for her niece's release, can cajole Luz to speak. The young girl's only confidant is her journal. Within its pages, Luz addresses an invisible higher power, sharing her secrets. Using the Lotería cards as her muse, Luz picks one card from the deck with each shuffle. Each of the cards' colorful images- mermaids, bottles, spiders, death, and stars-sparks a random memory. Pieced together, these snapshots bring into focus the joy and pain of the young girl's life, and the events that led to her present situation. But just as the story becomes clear, a breathtaking twist changes everything. A surprising, spellbinding tale richly imaginative and atmospheric, Lotería is an exquisite debut novel from an outstanding new voice in fiction. Loteria is a stunning debut novel from author Mario Alberto Zambrano. The chapters, each centered around a loteria card that Luz has drawn from the deck, are very short, with some only lasting for a few pages. The quick pace of the chapters helps keep you sucked into the book; I read about half of it in one sitting without even realizing it. Over the course of the book, Luz tells the reader about her family and upbringing. Her social worker and aunt are both desperate to get her to talk about the circumstances that resulted in her sister's injury and her father being put in jail, but Luz refuses to talk. The only way she'll express herself is through writing in her journal. The stories all seem like anecdotes at first until the threads between arguments and relatives and situations start to get connected. Very slowly, she reveals deeper details that show a family haunted by abuse, a family that makes Luz internally try to find ways to justify the shouting and the hitting and the drinking. It can be an uncomfortable read at times because you, the reader, know that what's happening in the Castillo family is not okay, and that Luz is unfairly and unjustly blamed for at least one incident of abuse that some of the story hinges around. Luz has a voice that is wise beyond her eleven years, and sometimes it was very easy to forget that she's such a young child. I found myself wondering how she gained this very mature voice for writing: is she well read? is she picking up on what other people say around her? is she exceptionally brilliant? is it just an authorial choice? I don't know if there's an answer, but it can be disorienting to remember that it's an elementary-school-aged child telling this sometimes very dark story. The physical book itself is also gorgeous, if the ARC I have is any indication. The cover is a much sturdier, textured paper than you usually see on books in general and ARCs specifically, and maybe this is an "I read too many books" thing, but I really enjoyed the feel of something a little different than the norm. 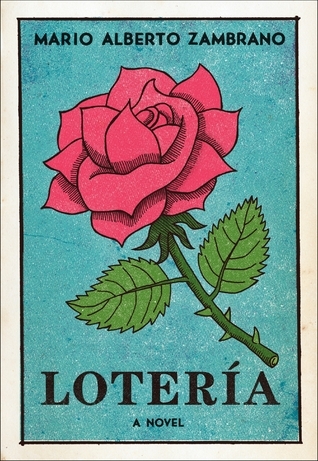 Each chapter is also introduced with a drawing of the loteria card that Luz is using for inspiration in her writing, Aside from being something interesting to look at, it also is helpful for non-Spanish speakers to connect with the card and to help identify the theme or message that is in the chapter. A lot of reviewers have commented on the fact that there are a lot of untranslated Spanish phrases in the book. They're right, there are, so you may want to have Google Translate handy if that bothers you. That said, I really appreciated that the little flourishes of language were left in. This is Luz's language and culture, and changing any of that would have felt like it was erasing part of her, to me. The ending of the story is left kind of open, so you may be frustrated if you want a concrete end to Luz's story. This book deals with a lot of mature themes, including abuse (physical, emotional, and sexual) and alcoholism, divorce, and has a lot of cursing (in two languages). It's a sober read with some lighthearted moments and is probably best for more mature readers.